Bomba on Panther Island was the second in Monogram's series based on Roy Rockwood's "Bomba the Jungle Boy" adventure stories. The plot is set in motion when agriculturist Robert Maitland (Henry Lewis) accidentally stirs up restlessness within the native population. The locals assume that Maitland is responsible for the recent spate of vicious attacks by a black panther, who is regarded as the Devil Incarnate. 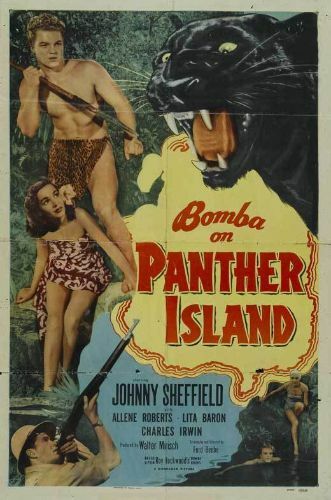 Bomba (Johnny Sheffield) proves that the panther is just another overgrown kitty-cat in a climactic human vs. animal battle. For those not interested in the plot or the papier-mache sets, Bomba on Panther Island offers two comely leading ladies, Lita Baron and Allene Roberts.